The Cuala Press was founded in the early 20th century as the Dun Emer Press, part of Dun Emer Industries which sought "to find work for Irish hands in the making of beautiful things," namely embroidery, weaving, and hand-press printing. Inspired in part by the fine printing movement in England as exemplified by the Kelmscott Press, the press strived to teach Irish girls the handicraft of producing exquisite books. It was operated by Elizabeth C. Yeats working with her brothers William B. and Jack B. Yeats as the press's editor and artist respectively. In 1908 the Dun Emer Press began producing a series of monthly broadsides. 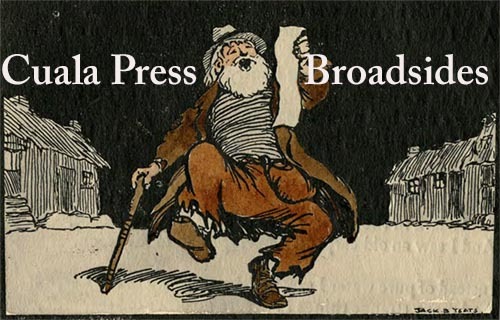 After the first issue, the press changed its name to the Cuala Press and continued the broadside series for seven years. The broadsides featured works of poetry, signed, unsigned, and pseudonymous, and hand-colored woodcut illustrations. Each issue was limited to 300 copies. The poetry in the broadsides covers a wide range of topics. Some praise fighters for Irish independence going back to the 18th century. Others laud early Irish mythic or historic figures. Some cover famous sporting events, especially boxing. Others trace the successes and failures of emigrants to America. As a whole, they bear powerful witness to the rebirth of national identity in the years leading up to the reestablishment of home rule in Ireland. This digital exhibition of Cuala Press broadsides was built by Linda Lear Center student assistant Katie Cowherd with assistance from student assistant Christian Salguero.